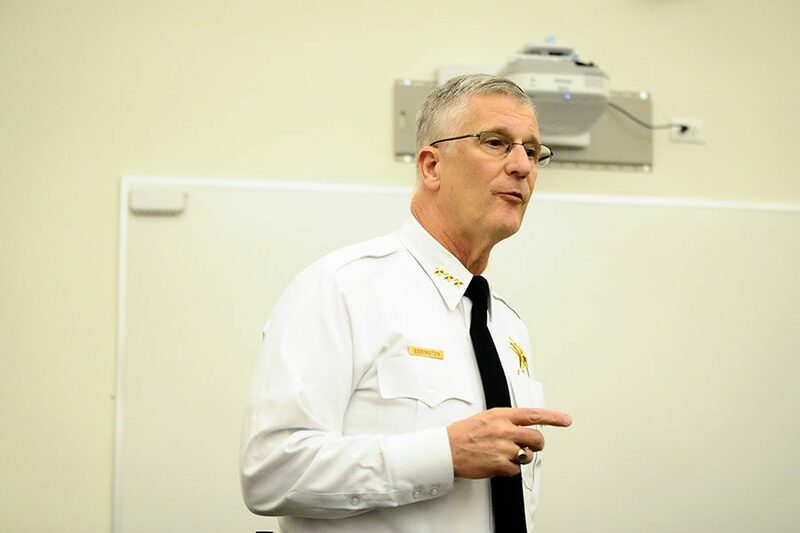 Evanston Police Chief Richard Eddington talks at a community event. Eddington said Thursday one officer had been reprimanded after the investigation into the arrest of Devon Reid and the other officer had retired. One Evanston police officer has been reprimanded and the other has retired after the arrest of Devon Reid, a city clerk candidate who in November was apprehended while petitioning in downtown Evanston, police chief Richard Eddington said. Sgt. David Berman retired during the department’s internal investigation into the matter, and Officer Amy Golubski was given a suspension, a decision she is appealing. In the meantime, Golubski will remain active in the force. The development comes about two months after Reid — a 24-year-old black man — was arrested at the corner of Sherman Avenue and Church Street for refusing to give specific personal information to an officer. The officer approached Reid believing he was in violation of a city ordinance that prohibits solicitation on Sundays. When Reid explained that he was petitioning for signatures, the officer pressed for his name, middle initial and date of birth. He gave the officer the first two pieces of information, but declined to share the latter because he felt he was not breaking any laws. Police initially charged him with violating a city ordinance, but soon thereafter dropped the charge. Reid, who believes the incident had to do with his race, said he was displeased with the investigation’s outcome. But Reid encouraged people to focus instead on the case of Lawrence Crosby — a Northwestern graduate student who in 2015 was arrested for stealing a car that turned out to be his own. Since the city released a video of the incident last week — in which officers can be seen kneeing and punching the unarmed student — there has been a loud call for reform. Eddington conceded that officers sometimes make an “error,” but denied the influence of race in any of their actions. He pointed to the demographics of the police force and its low complaint-to-incident ratio. At a City Council meeting in November following Reid’s arrest, Mayor Elizabeth Tisdahl apologized and told him the city was “taking it very seriously.” Other aldermen also chimed in to express their sympathy and encourage change.